A/V conferencing is a necessity in the modern business world. Busy executives no longer have time to travel to and from the airport and spend entire weeks traveling to meetings for topics that can easily be handled through a simple call. In fact, 70% of employees say they would rather have a video conference than travel to a physical meeting. When the demands of the corporate world cut into time that would previously have been set aside for meetings, video calls come into play. Our IT consulting experts can provide you with the best technological video conferencing solutions for your business. There are multiple reasons why a business owner would want to set up audiovisual presentation equipment. Not only does it bring clients directly to you without requiring them to leave their offices, but teleconferencing brings individuals and teams together face-to-face at the touch of a button from all over the country and the world. Businesses can reduce travel costs by more than 30% according to the latest reports. 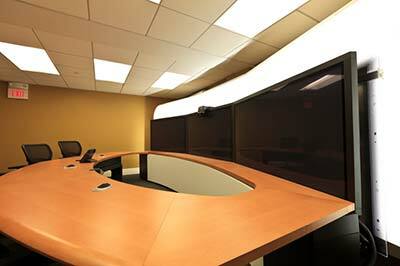 With video conferencing, corporate meeting places are a thing of the past. Collaborative environments can be created in individual offices, and employees can count on better communication than if it were an audio-only call. Roughly 93% of human communication is non-verbal. Because today’s world so often functions through text only, misunderstandings abound. Video conferencing allows that body language to be seen, improving meeting efficiency. The first step to establishing a more collaborative, cloud-based work environment is to select the correct systems for your needs. NSC Information Technology Group engineers and installs high quality conference solutions for offices, boardrooms and conference rooms. We use technologies that seamlessly connect multiple devices for presentation, teleconferencing, video conferencing, multipoint, and cloud based conferencing. Our network support and network security teams are on call at all times. Should your network go down, we are just a call away. We will determine the problem and work to correct the issue so your business can function at full efficiency. IT outsourcing saves you money. By using the services of NSC Information Technology Group, you save yourself the challenges of hiring highly qualified in-house IT personnel. Technological issues can crop up at any time, but they are much more likely should equipment or software be installed incorrectly. Our installation technicians will ensure that your equipment is installed properly, and our managed IT team is ready to resolve any network, software or technological issues. Our team of experts specializes in A/V conferencing. Rather than putting the matter in the hands of someone who works as a jack-of-all-trades, we have the knowledge and experience to provide you with exactly what you require. Contact NSC Information Technology Group today for all of your IT consulting and A/V conferencing needs.